In late 2001, I submitted my first project proposal to Creative Capital, in the performing arts discipline category. My project, entitled “She: Bike/Spoke/Love”, would be an innovative five-fingered spoken word event thrust into the eyes of American theater. With no holds barred, I wanted my production to have all of the following elements: spoken word, hiphop vernacular, dramatic tension, Spanglish, video projections, a turntablist, and onstage choreographed bicycling. I envisioned this project as a example of social justice theater which might be a catalyst for change. What kind of change? I wanted people to fall in love with poetry again. I wanted people to fall in love with bicycling again. I wanted people who had never seen live theater to fall in love with stage drama for the first time. Yes, this was all too ambitious for a newbie playwright like me, but I could not be convinced to file this idea under “give it up, baby”. to advance to the next phase; I had made the first cut! Naive and pretentious? Over-the-top ambitious? Probably. But there’s no harm done in going for broke, when your heart knows you are onto something potentially significant to others as much as yourself. At the beginning of 2003, I received good news. Headlands Center for the Arts, in Sausalito, California, was inviting me for a month-long residency. This was definitely out of left field, but I accepted readily. I needed to get out of Texas, and decided to make the month (March 2003) a time to check out the experimental theater and spoken word spots in San Francisco, Berkeley, and Oakland. Which I did. I also asked the Headlands staff to tell me who’d nominated me for the residency, to which they responded with the name Kevin Chen. Kevin Chen, an advisory board member at Headlands Center for the Arts, as well as Programs Director for Intersection for the Arts (multidisciplinary performance space in the Mission District of San Francisco), had actually sat on the Creative Capital panel which had deliberated over my bicycle play proposal the year before. The world was indeed small, and this worked in my favor! As part of my commitment to Headlands Center for the Arts during my residency, I was asked to present a public program in the performance studio on their campus. I elected to present a montage of various performance poems, including my first bicycle poem--which I performed on a borrowed Marin mountain bike. Members of a local bicycling group pedaled out together from San Francisco to see me. This was the first staged outing of my bicycle theater concept, though quite incipient. In November 2003, I hastily met a deadline to submit my new essay, “Bicycle or Boyfriend” to a literary competition hosted by Breakaway Books, publisher of fitness and sports-oriented titles. A forthcoming anthology, “Bicycle Love: Stories of Passion, Joy, and Sweat” would be comprised of the best sixty or so essays that they received in answer to the question: “Why do I love my bicycle so damn much?” In 2004, I received my contributor copies, happily sporting a new publishing credential. I used this moment to organize a book signing and reading at a local bike shop, hoping to build some buzz about bicycle literature and the performance thereof. I felt like a one-woman bandwagon, but the book signing went well, and I created waves among the bike shop staff who began to understand what I was trying to do. constantly. I daydreamed of ideas for staging, jotting down all ideas of worth. I attended open mic events, scouting for women (and bicycle boys) who seemed likely contenders for my play. I lurked on myspace, hoping to find the perfect dj/turntablist for the show. I applied for funding--again. In early 2006, I submitted a funding proposal to the National Association of Latino Arts and Culture (NALAC). Decision and award letters were to be mailed by the end of September 2006. In late September 2006, my dear friend and sister in performance art, Devin Adams was killed in a tragic accident while traveling in California. She had been riding her bicycle. A speeding driver struck her, and Devin died instantly. A brilliant light went out at once; she was only 27 years old. Her boyfriends and friends, fellow artists and collaborators, were all my kindred spirits here in Fort Worth. We were left devastated and despondent. However, the day after I learned of her death, I received a special envelope in my mailbox. It was a fat envelope. Envelopes from funding agencies are only fat, thick with documents for signing, when they’re going to give you money. When they finally fund your project. As I lifted that thick letter from the mailbox, I immediately thanked Devin. I knew in my heart that Devin had put in a good word for me--up there where it counts. And once I accepted this gift of funding from NALAC--with support from the Ford Foundation there was nothing to do but everything that I’d been waiting to do for years. And I decided to dedicate it all to the memory of Devin. The project was finally given the greenest light. A flurry of action and communication was set into motion, as contracts were signed, a new bank account was opened, and faith in my project restored. I even sent a last-minute application to the Puffin Foundation for supplemental funding, and received an award letter--with check enclosed--five months later. From my project proposal: “She: Bike/Spoke/Love” would be adapted for a multimedia stage performance, including the participation of local artists, musicians, videographers, women poets, and low rider bicyclists. How you bring in all the people, the talent you need, is about framing the invitation, the recruitment pitch, as an opportunity. An opportunity to act and perform in a play--well, yeah. But beyond that, an opportunity to be an integral member of a creative temporary community which aspires to make an impact on the larger community. There are sometimes folks on the sidelines who want to play, and, if you’re good at scouting the right ones, you might end up with a benchwarmer who has latent star power and creative skills for a project like yours. Layne Calabro, who created our project’s website, designs and oversees maintenance of websites as her full-time profession. But what I needed was an artsy website design, and Layne was itching for a creative project. She had fun building the site, and the project benefited from her stellar skills. 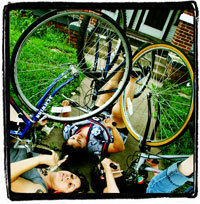 It didn’t hurt that she was also a bicyclist and had recently started writing poetry as well. Multiple connection points. She was a perfect match for our project. On opening night for the play, Layne even read an original bicycle poem during the pre-show program. My lead actress, cast to play ESA, was also a magical choice from a serendipitous meeting. It didn’t hurt that Dominique was also a fan of poetry and quite good at writing some of her own--plus she sang and composed songs on her guitar. Everyone has hidden talents. I researched for over five years and have to-date found no existence of a theater play about young people and bike culture which features bicycling onstage as part of the dramatic action. Therefore, I felt I had a right to assert that “She: Bike/Spoke/Love” was definitely Texas’ FIRST and probably the world’s ONLY bicycle theater play. Yeah, I said it. I like that this suggests that I’ve created an entirely new theater sub-genre. Positing onstage bicycling as dance. Bringing 2-wheels and underground bicycle culture into American stage theater like motorcycle gang culture got folded into 1960s-era Annette and Frankie beach movies. Who doesn’t love getting in on something new and different, especially in the arts? Much of the performance takes place from the seat of a bicycle, so my quite cooperative cast members had to haul bikes around to rehearsals and practice their lines while pedaling in small quarters--along tightly-choreographed trajectories of dramatic action. This is saying quite a lot when you’re rehearsing outdoors in the heat of a Texas summer because you cannot find a (cheap or free) suitably-large indoor rehearsal space with air-conditioning. We sweated a lot that summer of 2007 doing all our pre-production work. I tried to mitigate the inevitable discomfort by providing cold beverages and scheduling rehearsals late in the day--in the shade of bridges and trees. But all the rigor and hard work and sweat of our combined efforts paid off on World Car Free Day (September 22nd, 2007), the night of our premiere performance--in Fort Worth, Texas, at the Sanders Theatre. A standing room only audience affirmed and applauded this first presentation, which has since been followed by two encore performances (November 11th, 2007)--also in Fort Worth. Now, five years hence, we are launching the Austin premiere of "She: Bike/Spoke/Love", in partnership with the Mexican American Cultural Center (MACC), as supported by the City of Austin Parks and Recreation Department. I am also pleased to say that United States Artists has done me a great favor in selecting me as an inaugural artist for their website-based Projects funding initiative. Having an opportunity to take this original work to the veritable Texas Capital of Bicycling (doesn't Lance Armstrong live in Austin?) thrills me to no end. Me and my (mostly) new cast and crew will be there during National Bike to Work Week 2012 to perform outdoors, near the hike and bike trail outside the MACC on the weekend of May 18th-19th.